Albert Einstein (1879-1955) - E=mc². That was the equation that made Albert Einstein a "rock star" within the science community and across the wider world as a whole. He was a theoretical physicist with a mind quite unlike anyone else's. The very name "Einstein" has become synonymous with genius. Believe it or not, as a teenager he actually struggled academically for a time. But this was due more to the method by which he was taught than to his natural intelligence. He later explained that he felt inhibited by the standard "repetition" and "memorization" approach. When he was 16, he took the entrance test for Swiss Polytechnic in Zürich. Although he failed to pass the overall examination, his aptitude in physics and math was exceptionally high. 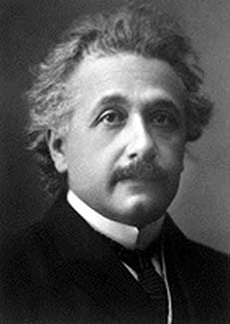 It was, of course, while working as a patent clerk in Bern, Switzerland in 1905 that he developed his special theory of relativity and the equivalence of matter and energy (E=mc² which is perhaps the most famous equation in the world). Many non-scientists confuse Einstein's special theory with his general theory of relativity. His general theory was worked out ten years later in 1915. The difference between the two (in layman's terms) is that the special theory draws the connection between space and time, whereas the general theory expands it to include gravitational fields. Based on this theory, Einstein predicted that gravity had the ability to bend light. It was a theory which was testable, but only under a single known condition; by observing a total solar eclipse. On May 29, 1919, a crew led by Arthur Eddington traveled to the island of Principe and photographed such an eclipse. Sure enough, the pictures revealed that Einstein had been right. Light coming from behind the sun was bent by the star's gravity and could be seen on the opposite side. The revelation made Einstein an instant celebrity and recipient of the Noble Prize for Physics in 1921. In truth, he contributed much more to science than his theories of relativity and matter-energy equivalence, but I have not the understanding to adequately explain what they were. For a scientist, he was remarkably imaginative. For example, it was his dreaming of riding on a photon that enabled him to realize that space and time are inexorably linked. Einstein saw the universe in a way that no one else previously (or perhaps since) had.